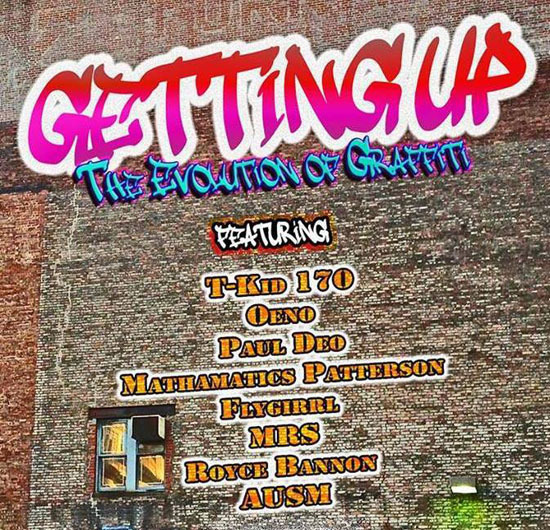 "Getting Up – The Evolution of Graffiti"
La Maison d’Art, a one of a kind estabilshment. La Maison d’Art is both a hotel and an art gallery. Each room has been distinctively designed and decorated with paintings and sculptures made by rising artists. On the ground floor, the art gallery hosts monthly exhibits. Located in Harlem, this unique hotel is the perfect place to stay for any art-lover traveling and visiting New York City. You may have been fortunate to attend the opening reception of this exhibition on August, 4th at La Maison d’Art Gallery. If not, you still have until August 24th to see Getting Up – The Evolution of Graffiti. This exhibit represents the evolution and cultural influence of Hip Hop on Graffiti, from the roots of this art style that was born in New York in the 70’s to its evolution and influence on French artist OENO. The presentation features works by T-Kid 170, Paul Deo, Mathamatics Patterson, Flygirrl, MRS, Royce Bannon, Ausm and OENO. Graffiti, an unconventional art form. Possibilities to characterize Art are infinite and you might have your own definition of it. Some think Art is about creating a visually aesthetic work and requires technique and style. Some think it is a way of expression, of spreading a message. For others, Art is supposed to make people react and be thoughtful. Have you ever been wondering whether graffiti truly is Art? No one can blame you for that. Graffiti has often been criticized and questioned since it is unusual, unconventional and mostly illegally applied. However, it has been gaining recognition as a form of art for street artists use their creativity and talent to express themselves and walls and trains as a canvas to reach as many people as possible. Graffiti communicates the artist's identity and ideas.It makes a statement. Graffiti art involves imagination, planning, determination and not to forget talent from the artist express themselves and inspire people. This artistic movement originated in the streets and subway of New York in the 70’s and was mostly a means to get one’s name known. It quickly became a means to denounce facts or express ideas. Many well-known artists such as Jean-Michel Basquiat began their artistic career and became famous because of their graffitis. Nowadays, many galleries in New York and Europe showcase bring graffiti to the attention of the art world. Find out more about the beauty of this controversial art by visiting the exhibition and get inspired! From August 4th to August 24th.